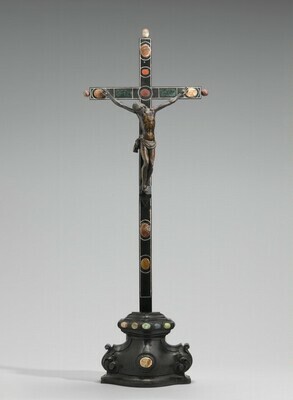 Private collection, Florence; (Luigi Grassi, Florence); (Michael Hall Fine Arts, New York), before 1971; purchased c. 1983 by Mr. and Mrs. John R. Gaines, Lexington, Kentucky; gift 1991 to NGA. Notes dated 6 February 1991 in NGA curatorial files record that Michael Hall said he acquired the sculpture from Luigi Grassi in Florence, and that Grassi had acquired it from a Florentine family. Giambologna 1529-1608, Sculptor to the Medici, Royal Scottish Museum, Edinburgh; Victoria & Albert Museum, London; Kunsthistorisches Museum, Vienna, 1978-1979, no. 110, repro. Art for the Nation: Gifts in Honor of the 50th Anniversary of the National Gallery of Art, National Gallery of Art, Washington, D.C., 1991, 36-37, color repro. Avery, Charles. Giambologna. The Complete Sculpture. Mt. Kisco, NY: 1987: 264, under no. 97. Sculpture: An Illustrated Catalogue. National Gallery of Art, Washington, 1994: 30, repro. Avery, Charles. Giambologna. An exhibition of sculpture by the Master and his Followers. From the Collection of Michael Hall, Esq.. Exh. cat. Salander-O'Reilly Galleries, New York, 1998: 74.